Sprinkles ain’t the only cupcakery in town. Maybe it’s the anti-conformist in me, but I refuse to believe Sprinkles has the best cupcakes in the Greater Los Angeles Area. And it’s only about 5- 10 minutes from where I live. I’m not saying Sprinkles is bad, it’s just not as great as people say it is. 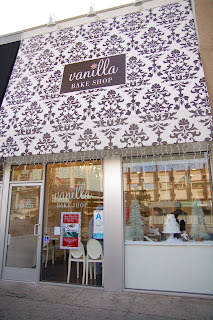 With that said, I’ve been to Leda’s Bake Shop in Sherman Oaks and recently I went to Vanilla Bake Shop in Santa Monica. I think both places have better cupcakes than Sprinkles does but this entry is solely on the bake shop in Santa Monica. Fortunately, Santa Monica is not too far from where I am, unlike the valley where Leda’s is at. It’s a quick hop on the 10-West and maybe a 5-10 minute drive on the freeway. Though I won’t frequent the place because of the convenience factor, or lack thereof, I still think it was worth the drive, given it’s not much of one. 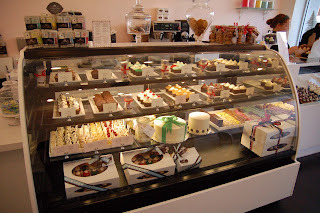 The layout of the bake shop is very simple. But from the looks of it, it’s not a place meant for sitting down and enjoying your cupcake. There are only two tables and a couple of chairs for each, which is fine, because I intended to take them home anyway. One thing I like about Vanilla Bake Shop is that they have “Cupcake Babies.” They’re all you can get from a normal cupcake, but a lot smaller (Leda’s Bake Shop also has mini-cupcakes). This is something Sprinkles does not have. 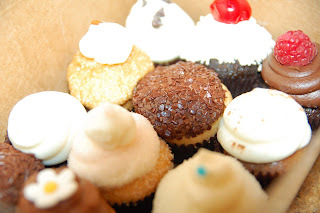 The thing I like about the miniature cupcakes is that you can try many different flavors without getting full or sick of the same flavor because the cupcake was too big. I think the “Cupcake Babies” are perfect sizes for cupcakes. 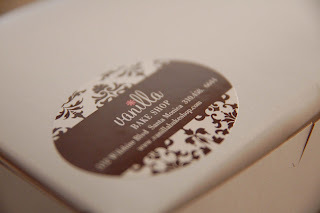 As far as the taste goes, I think Vanilla Bake Shop makes better tasting cupcakes. Maybe it was because I had the miniature cupcakes rather than the big ones, but I doubt that. The cake itself was fluffy and moist. 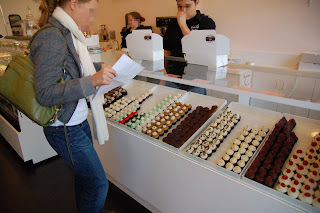 I find the cakes in Sprinkles cupcakes very dry and heavy, and the frosting way too sweet. The frosting on the cupcakes at Vanilla Bake Shop seemed just right. Some of my favorite flavors were Old Fashioned, Pumpkin, Southern Red Velvet, and Chocolate Rasberry. The frosting, the cake, and the fillings for Old Fashioned and Chocolate Rasberry complimented each other very well. With the rise of all these cupcakeries in the Los Angeles area, the cupcakes look more and more like pieces of art. Although presentation is big, taste is obviously the most important factor. And I think that Vanilla Bake Shop has better cakes than Sprinkles and they have good frosting to accomodate their good cakes. As you may have noticed, the place is called a bake shop. This implies they sell other baked goods. I have not tried any of their other baked goods, but judging by how good their cupcakes are, I think I can fairly say that all their other stuff seems good. But that’s to try on another day. An article on Daily Candy. Taco Crawl on York Blvd.